3) Feasibility of long-term follow-up of these children for monitoring of late sequelae. This WP is lead by Irmandade da Santa Casa de Misericordia de Sao Paulo, with Institut Catala de la Salut co-leading. The figure below shows the flows of subjects involved in these studies. 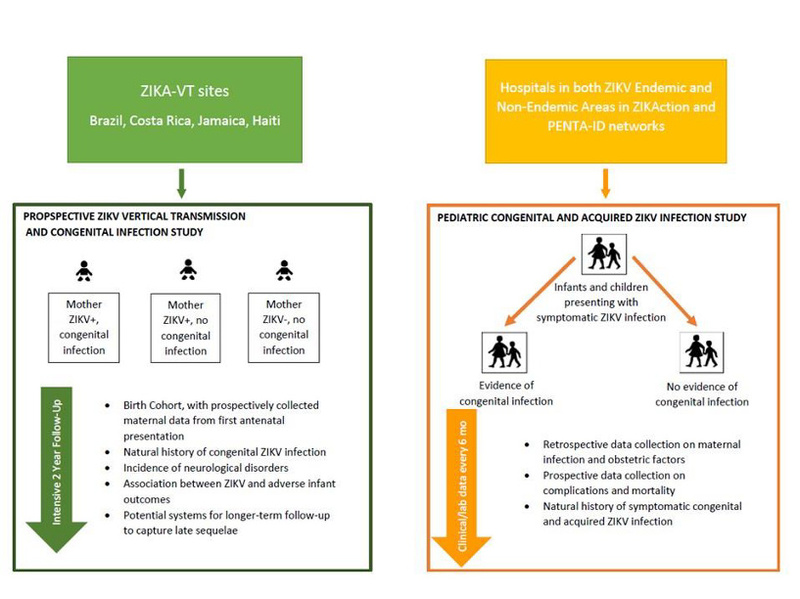 Infants born to mothers participating in ZIKA-VT studies will be included, as well as children who present with ZIKV infection at hospitals in both ZIKV endemic and non-endemic areas. Specific tasks in this work package include study staff training, enrollment into studies, clinical developmental follow-up of children with both congenital and postnatally acquired ZIKV infection, statistical analysis and assessment of feasibility of long-term follow-up.